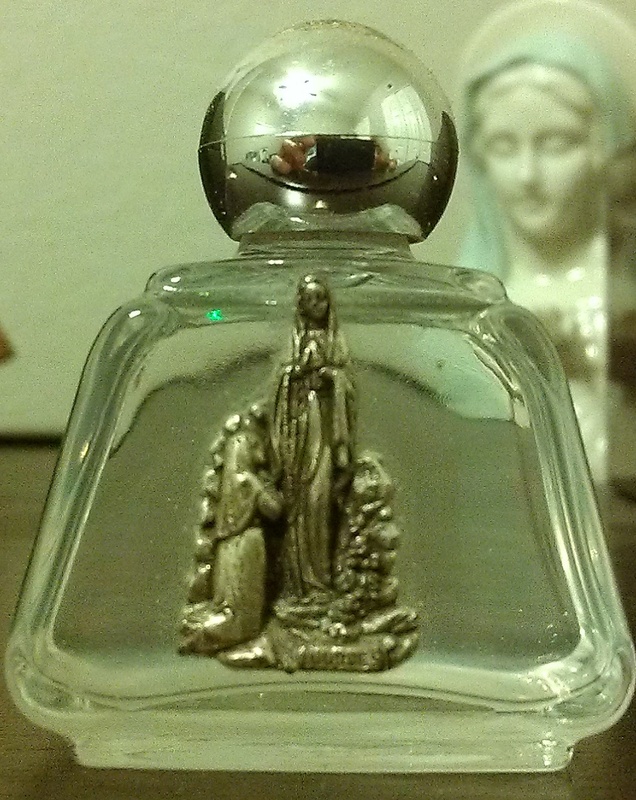 Thirteen years ago, when I was the youth coordinator at St. Thomas Aquinas Catholic Church in Avondale, Arizona, one of my teenagers brought me back a small glass container of holy water that she purchased at the Marian Pilgrimage Shrine of Lourdes in France. She went on pilgrimage with her high school, Xavier College Preparatory. The school to this day continues to take students to Lourdes. I still have this small container (pictured here) and it goes everywhere I live. It has traveled from Arizona, to Ohio, then to Texas, and now back to Arizona. It has become a permanent fixture in the small Marian “shrine” that sits on top of my dresser in my bedroom. I have yet to break the seal. 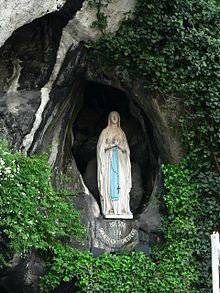 Today is the memorial for Our Lady of Lourdes in the liturgical calendar of the Latin Rite. 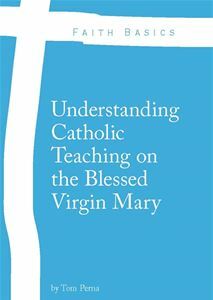 The documented events of this Marian apparition began on February 11, 1858 when the Blessed Virgin Mary appeared to Bernadette Soubirous, a young peasant girl of 14 years of age. From February 11 to July 16, 1858, Bernadette received from the Blessed Virgin Mary eighteen apparitions. The heart of the message Bernadette received was a call for greater prayer and penance in reparation to God, and the conversion of sinners. 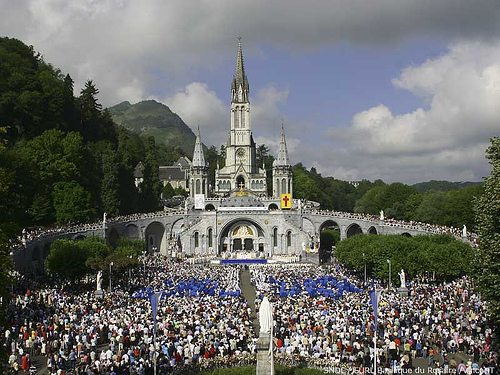 One of the major proclamations from Lourdes is the importance of praying the Holy Rosary. Bernadette would often pray the Rosary during the times she witnessed the Blessed Virgin Mary. The Lady herself would then join in and pray the Rosary with Bernadette. The Rosary is not a prayer to Mary, but it’s a prayer focusing on the life and mysteries of Jesus Christ. So many of the saints throughout the centuries (like Padre Pio – this is for a friend who wears a ring with his image on it) have encouraged the lay faithful to devoutly pray the Rosary. The reason why so many faithful pilgrims flock to Lourdes is to touch the rock where Our Lady appeared to Bernadette and to see the spring that came from the rock that Bernadette drank and washed in. 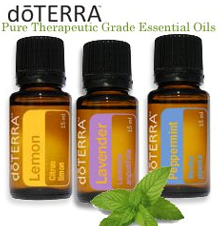 This spring has brought forth miracles of healing to 67 documented cases (approved by the Church). These cases have undergone intense medical investigations whereby they have been truly understood to be of a miraculous nature. This must occur so that those who claim they have been healed from the spring do not bring scandal to the faithful of the Church. It also assists the Church when they declare if the apparition site is authentic and bearing fruit. In a world that rejects the supernatural more and more, the physical signs of healing at Lourdes represent the saving power of God’s grace in today’s modern age. Wow! What an amazing experience for young Bernadette to witness and to be able to present it to the world. The part of this apparition that touches my heart is that Our Lady’s voice vibrated with such emotion when she declared her name. This apparition also shows us how important the sinless state of our Blessed Mother truly is in light of the dogma declared by the Church. On this day of Our Lady of Lourdes, let us remember that we must always seek a deeper conversion each time we repent from our sins. Praying the Rosary is so very important since it’s the weapon against Satan (St. Pio of Pietrelcina). Our Lady of Lourdes…Pray For Us!